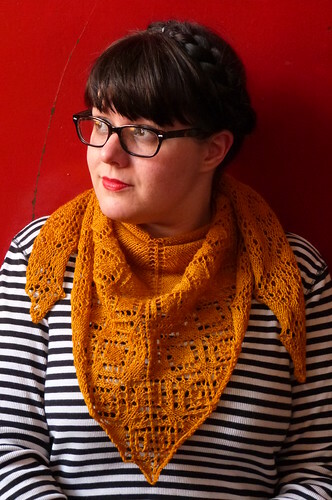 My Kirkja shawl pattern is currently available for free on Ravelry. Offer expired, sorry! As you may be aware, local boy Andy Murray took home the Wimbledon men's title yesterday. He is the first British male to do so for 77 years (though the marvellous Virginia Wade won the women's title in 1977). Scotland has gone a bit crazy as a result - and I have lived in Glasgow so long that I feel this strange sense of pride too. It's rather odd but who am I to quibble with a sense of belonging? Before the match I decided that if Andy Murray defied the odds, I'd offer one of my paid patterns for free. And because Andy won, you can now use the code comeonandy to get Kirkja for free until 6pm GMT tonight. Almost 1250 people have snapped up Kirkja in the last 19 hours. Do join them! Maybe even dip into the Karie Bookish group and show off your Kirkja shawl once you've knitted it! An aside: I like this photo a lot. I didn't use it as a pattern photo for various reasons, but I like it a great deal. It looks like me - and I cannot begin to tell you how much that means to me. Modelling my patterns is one of my least favourite activities. I feel very conscious of the way I look and how far I am from the standard 'model look'. Ravelry is a great place for showcasing different body types, but I still dislike the way I look in photos. I note all my flaws and imperfections before I look at how the knitting looks. It feels awful, just awful. So, it's a big thing for me to say that I like a photo. That was a bit of an aside! The rest of today will be used on sprucing up the website (have you noticed the new layout?) and on getting the next Doggerland pattern sorted. If you are one of the Kirkja downloaders, do stick around. Plenty of exciting things happening!